It's always a surprise when I get down to knitting on a new project after the doldrums. I've occasionally been surprised that I bothered at all, that I hate what I ended up doing and I start another new thing. Today it has gone the other way. 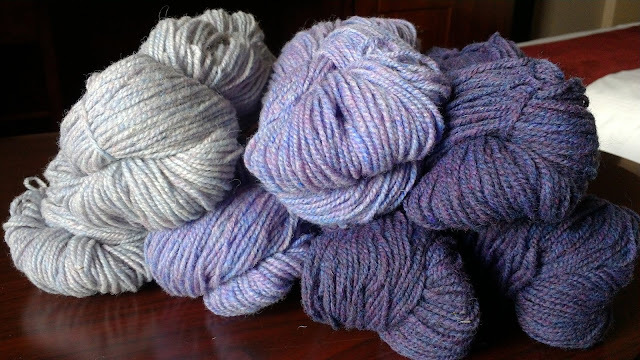 I took out the pretty purple Regal from my trip this summer, intending to start a sweater for me. I started by winding it all up. I really do enjoy winding yarn, particularly since I set up my little winding station and it is always right at hand. As I wound, I thought of what I wanted from these pretty purples. A gradient of some sort but nothing complicated. I was thinking about what I would do with all the leftovers. I have a sweet granddaughter. She loves purple. I had purple. Lots of purple. Why wait to knit her sweater with the leftovers of mine? Maybe I should knit mine with the leftovers of her sweater. And that is what I decided to do. I'm pretty much doing what I was thinking of knitting for me, for her. It's really cute. Her version is raglan sleeves and I am just a wee bit past the underarms. That wide band of stockinette is my probably too wide steeking band. 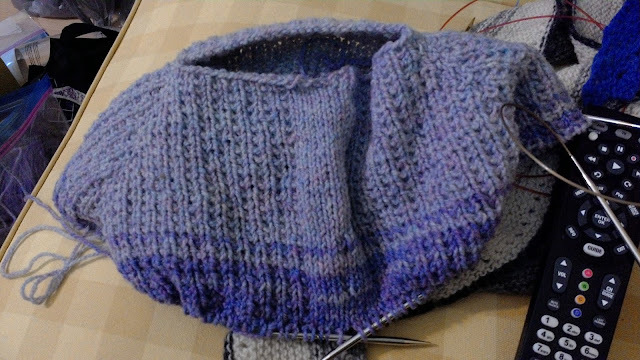 I didn't want jarring colour changes so I really only had a few rows to get in some stripes. One row of the new colour followed by three rows of colour one and switch. This second colour band will be about as wide as the first band, followed by the darkest purple to finish. It may be a little thinner because I do want the biggest part of the sweater to settle into the dark purple that she loves. It is a matter of scale. Too much of the mid purple and the next colour change hits her waist, splitting her in half. The lighter colours must remain firmly on the top of this sweater. I am using the other sweater as a size guide for this one, though this one is going to be longer, more of a tunic length I think. I have plenty of yarn and her whole sweater won't take much more than 400 metres. I have lots more yarn than that. It's a busy weekend ahead. I have company for part of it and this Saturday is the inaugural Mundare event of World Wide Spin In Public Day. I think we are going to have a nice little group of spinners and knitters and I'm looking forward to it.